Problem. If you spend all your time cold calling people or conducting interviews, you don't want to lose important client insights. But with many clients and conversations across different team members, it's easy to lose track of decisions, insights or action items. This can affect your outcomes and effectiveness as a team. Solution. Anytime you have a meeting, Notiv is on your side. You'll always have a single source of information for every conversation, decision and action item that shapes your outcome. Revisit these meetings at anytime and share them with your team. 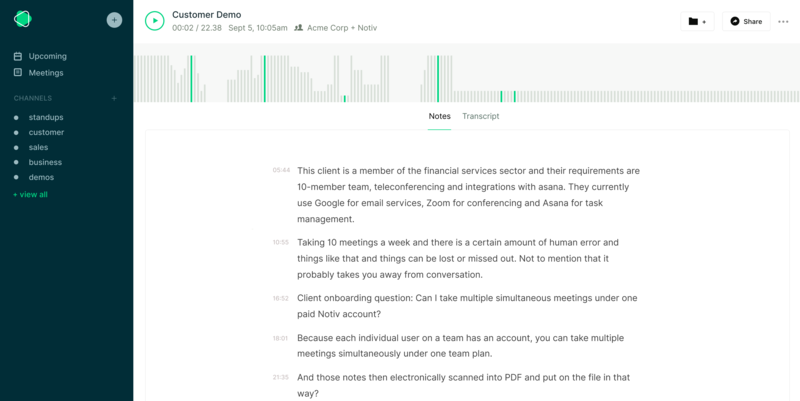 Support all your clients effectively by automatically capturing important insights. Plus, it's cheaper than coffee. Notiv allows you to be present in your conversation by getting rid of the menial and freeing your mind to focus on the important things. Capture important moments and information securely place with Notiv. It'll even analyze your call and give you back your data instantly! Drive outcomes from your meetings. You'll never be lost or uninformed because Notiv willl automatically highlight important moments in your conversations for you to review and share! Inform your team or client. Across different meetings, clients and team members, Notiv ensures that your team can collaborate and share information with ease.